The Superwinch Winch 2 GO is an all inclusive self-recovery winch kit with everything you need to rescue yourself; off-road with your 4-wheel drive vehicle, ATV, or snowmobile; unloading or loading your boat; or on the job site pulling a load closer to your truck, the Winch 2 Go is handy an always ready "2 Go". 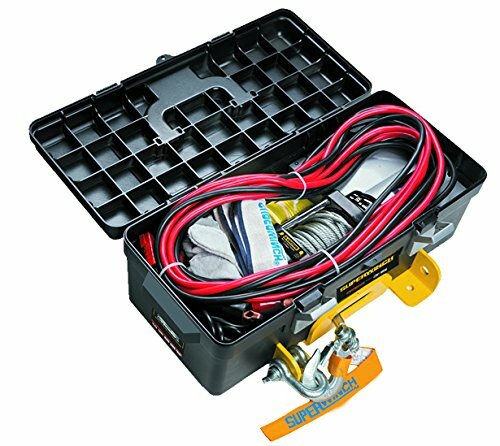 Winch 2 Go is a complete winching solution in a convenient kit that features a 4,000 lb rated line pull winch on a unique powder coated winch platform, all in a compact, easy to carry composite tool box. The kit is easy to store, use, and repack. Completely portable Winch 2 Go requires no installation and does not require a winch mount; however, it can be permanently mounted on a trailer and be used a utility winch if desired. If you have any questions about this product by Superwinch, contact us by completing and submitting the form below. If you are looking for a specif part number, please include it with your message.